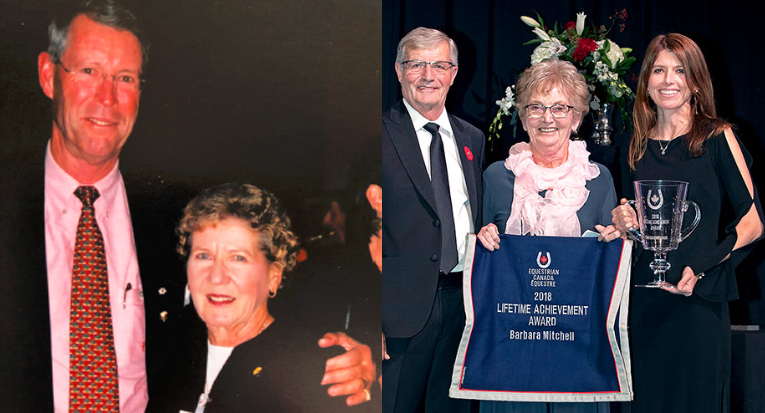 Harriet Cherry and Barbara Mitchell were both honoured with Equestrian Canada Lifetime Achievement Awards. Equestrian Canada (EC) is pleased to announce the 2018 National Award recipients, recognized for their impressive achievements and contributions to the growth and success of the Canadian equestrian community. The 2018 recipients are as follows. Click on the recipient’s name to learn more. EC would like to thank everyone who participated in the 2018 EC National Awards, including the many individuals who submitted nominations to support deserving individuals. Across the board, the quality of the nominations was extremely high for 2018, which is a testament to the world-class athletes, owners, officials, organizations, volunteers and supporters within the Canadian equestrian industry. EC would also like to thank the Awards Committee for their time and effort in selecting the 2018 recipients, with support and input from EC stakeholders and experts. The 2019 EC Awards Committee is comprised of Carla Robin (Chair), Jennifer Anstey, Michael Boyd, Peggy Hambly, Karen Sparks and Robyn Tremblay. Stay tuned for more information on the 2018 EC National Award presentations. Details coming soon!